Welcome back and I am wishing you a huge 2016! It’s a fact: a truly impressive back is about as rare as a functioning senate or a three syllable word on an episode of the Kardashians. For one reason, it seems Monday is worldwide chest and biceps day, in any gym on this planet. Motivation then quickly falls apart, the scheduled back day on Wednesday is often skipped in favor of the Breaking Bad marathon, and don’t remind me about legs on Friday. But then there are people who do train their back and still do not have much to show for. For those, I sacrificed my Sunday afternoon and wrote this piece. a. 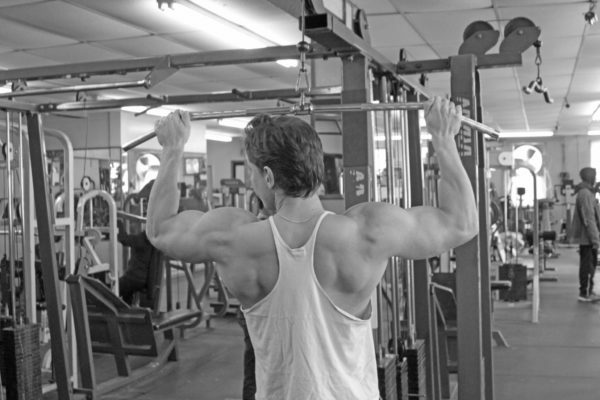 Start every rep from the shoulder blades. They go backwards before the arm even bends. b. If possible, use an overhanded grip to exclude the biceps from the motion. If you do an underhanded pull, make sure to get a good two inches of movement from the shoulder blades, before involving the arms. c. Focus on your elbow going toward the ribcage, not the wrist. Focusing on the wrist will make the pull much more forearm or biceps oriented. d. Use a light grip. Most trainees grip the bar or the dumbbell extremely tight when pulling, which again leads to an overemphasis on the forearms and biceps. I would recommend to use a very light, three-finger hold for the first sets. This will enable you to establish a proper mind-muscle connection for the exercise. For the heavy sets, you might still grab the bar for all that’s worth. 3. Do deadlifts. I shouldn’t even have to write this but just to be clear: in order to build an impressive back (or physique for that matter) you must pick up heavy stuff from the floor. It even works with the current craze of “functional training”, since improving your ability to move heavy items off the ground is about as functional as it gets (or at least a close second to the overhead press). 4. To strap or not to strap? I may sound whimpy, but I do think straps have a place in training for bodybuilding. It is simple: your forearms are smaller than your lats, so they will give out earlier. This does not mean you should use straps all the time or even wear them on the treadmill, but they can be helpful during the heaviest sets or toward the end of a back workout. Straps, used properly, will enable you to focus entirely on the back and not having to worry about your forearms failing. 5. Do pull ups every day. Yes, you heard me. Some of my biggest gains came when I started each workout with 50 pull ups. I would vary my grip either each set or each day. In addition, I was training in different gyms at the time so each one had a different set up. In short, there is nothing better for lats, biceps, forearms, rear delts, and even abs than the good, old fashioned pull up. I was also around 245 lbs around that time, so that was fun. 6. Do stiff arm pulldowns, but do them right. The stiff arm pull down can be used as a finish movement to fully exhaust the lats or in the beginning of the workout to establish a proper mind-muscle connection. Stand about shoulder wide, with a slight knee bend, and grab the bar one inch away from your ac joint. Have the palms resting lightly on the bar, and with slightly bent elbows bring the bar all the way to your legs while the head stays in a neutral position. Previous post: Steady state vs high intensity cardio- which one rules supreme for fat loss? Next post: White rice vs brown rice-which one is better for you?